I never did get to the end of my Christmas sewing list. To be honest, I was never going to… it was more of a ‘keep-sewing-something-for-everyone-you-know-until-you-run-out-of-time’ type of thing than a formal list. Either way, it’s done for now and time to sew a few bits for me. I’ve been itching to try the patterns in this book since I got it a couple of months ago. 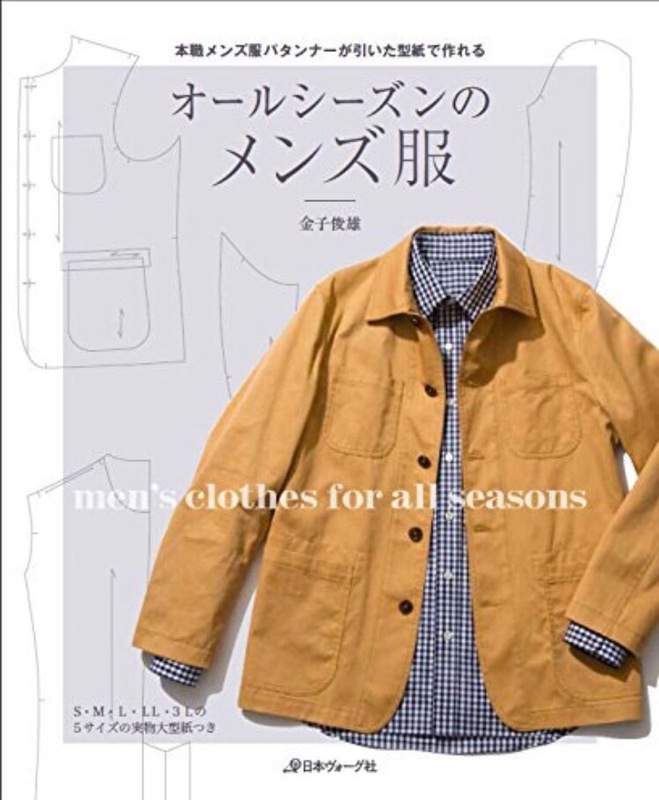 I’d seen @peterlappin (of ‘male pattern boldness’) on Instagram making the jacket on the cover and I’ve not seen another pattern book dedicated to making menswear, so I tracked it down and ordered a copy. Last October MrA & I took a relaxing week in rural Normandy, just driving around, eating the cheese, enjoying the food & open air. This was all made possible by the invention of satnav. You see, I am a fully competent driver but I lack the ability to remember which A-road we need in half a mile or whether it’s left or right… goldfish driving. MrA was (in his own words…) ‘born to be chauffeured’ and is worse than terrible at map reading. … Except in France. We turned up to be told that they only had one satnav left, and it was broken. I could try plugging it into the car, but he wouldn’t charge me for it. I wasn’t particularly thrilled at the bargain offer of free-broken-satnav, as I’m sure you can imagine. Much less thrilled at the fast-forward-mental-image of us constantly lost and constantly bickering on the backroads of Normandy! All was saved when I realised that I could use the European roaming on my phone. I normally switch it off on holidays and just use it as a camera, fearing huge data charges, but it was a good deal (& worked out cheaper than hiring the satnav, a working one anyway, as broken ones are free). Clear roads. Blue skies. No bickering and a constant dot on the screen telling us exactly where we are. 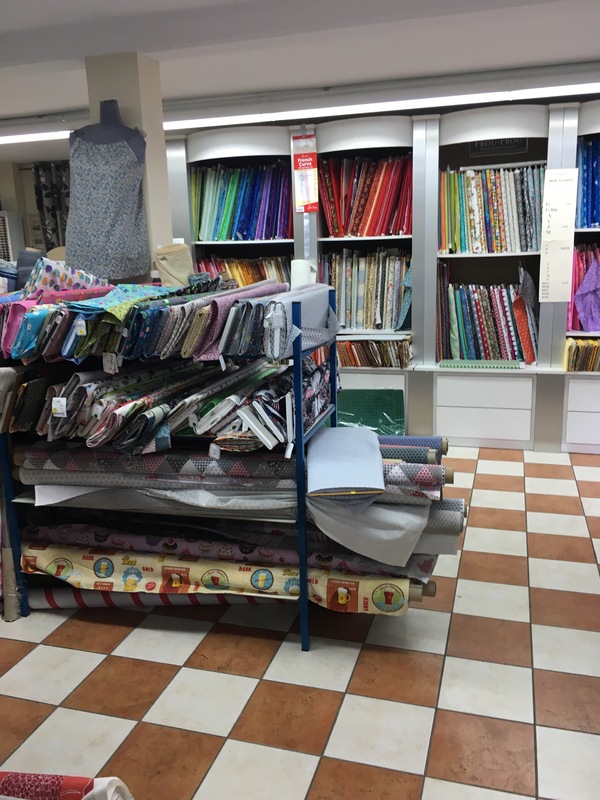 The added benefit (& this is where it becomes sewing-related…) was that whenever MrA went to the bathroom, I could google for ‘fabric shops near me’. 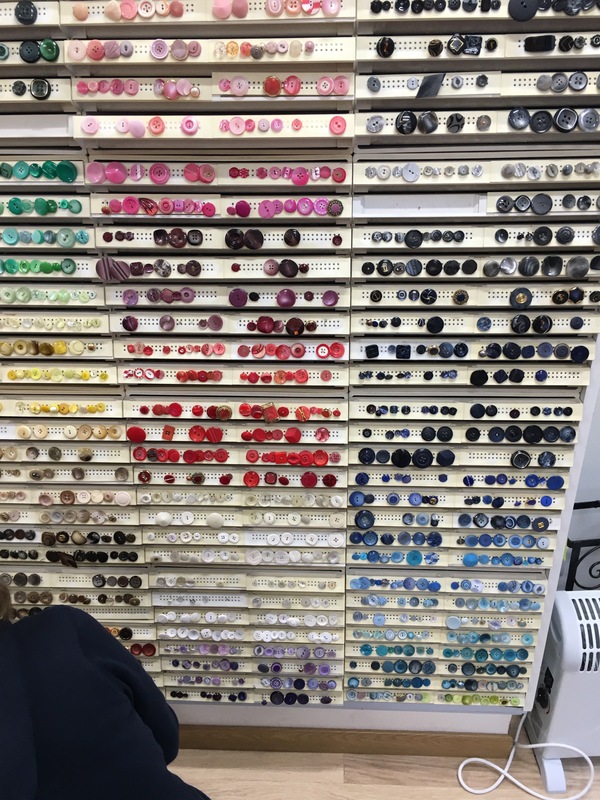 Then, when he came back and said ‘which way shall we go now?’, I could go ‘… hm… let’s try… this way!’ And we’d stumble upon another fabric shop. I wasn’t all selfish though, occasionally I made sure we stumbled upon an antiques shop or two to keep MrA happy. 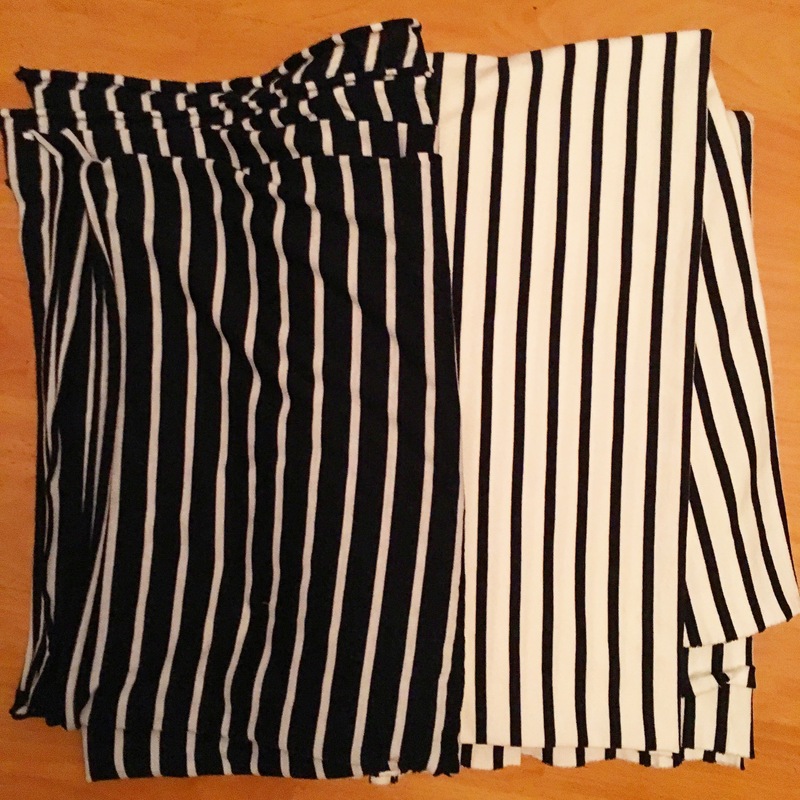 I bought two sets of jersey stripes; one, t-shirt weight, mainly blue. And one slightly heavier, for a long sleeved tee, mainly white. 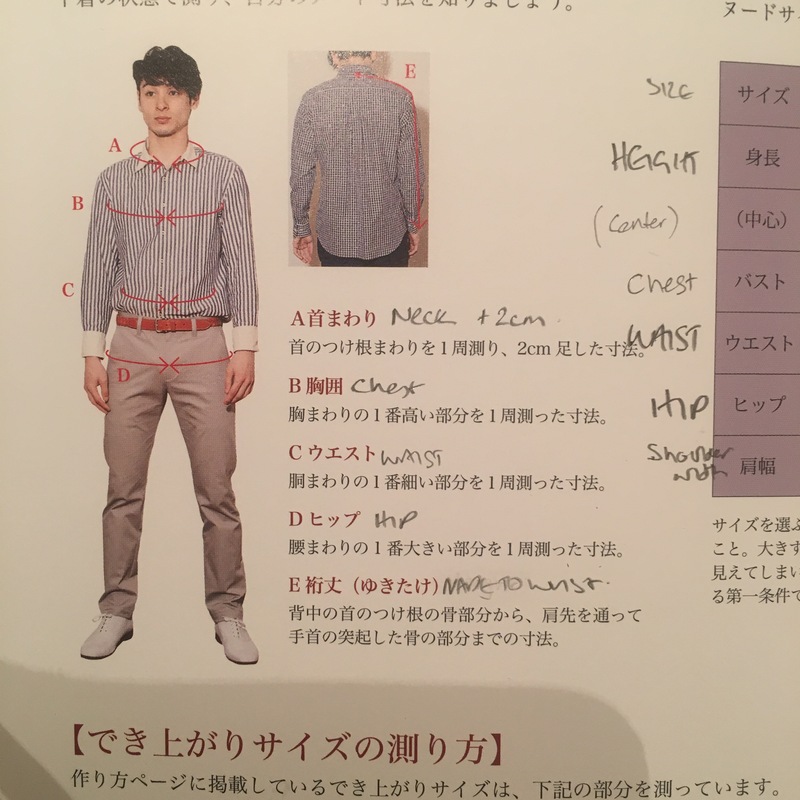 The book is all in Japanese and as I don’t read Japanese, I used google translate to decipher the sections on finished size & what pattern pieces to look for on the multi-printed sheets. I thought I’d keep it simple at first and start with the tshirt. 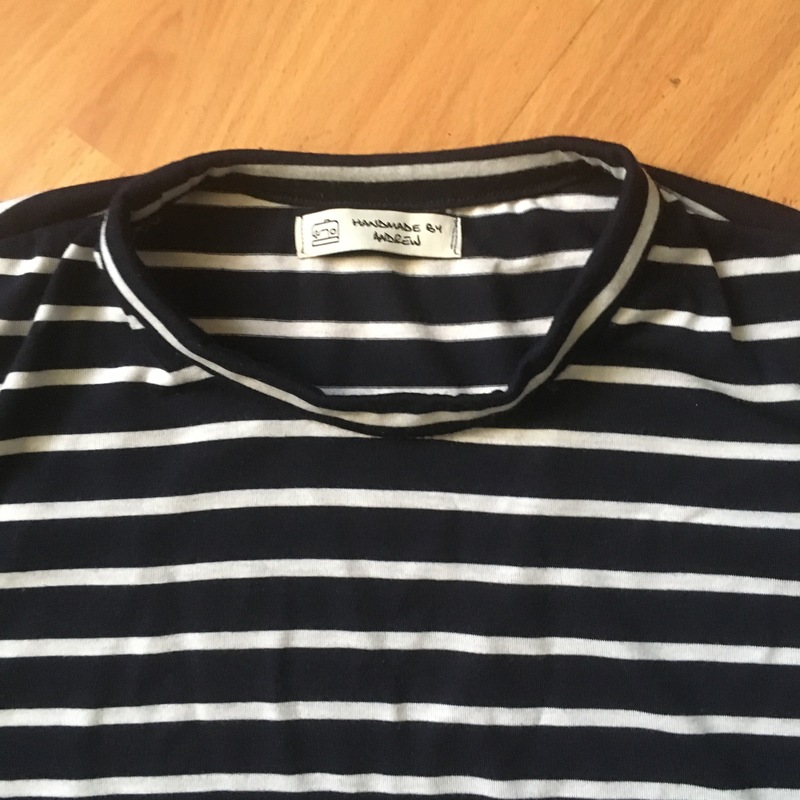 The sizing chart on the body measurements put me between an M & L. Then I checked the measurements by the tshirt and I matched up better to size S. So I’m glad I spotted the difference. The photos explain the order of construction without really having to translate the words. It went together nicely, but I didn’t get to match much more than one or two stripes per sleeve. The one that was on the notch lined up okay, but there was no wrestling the others into place without ending up with a rouched shoulder. 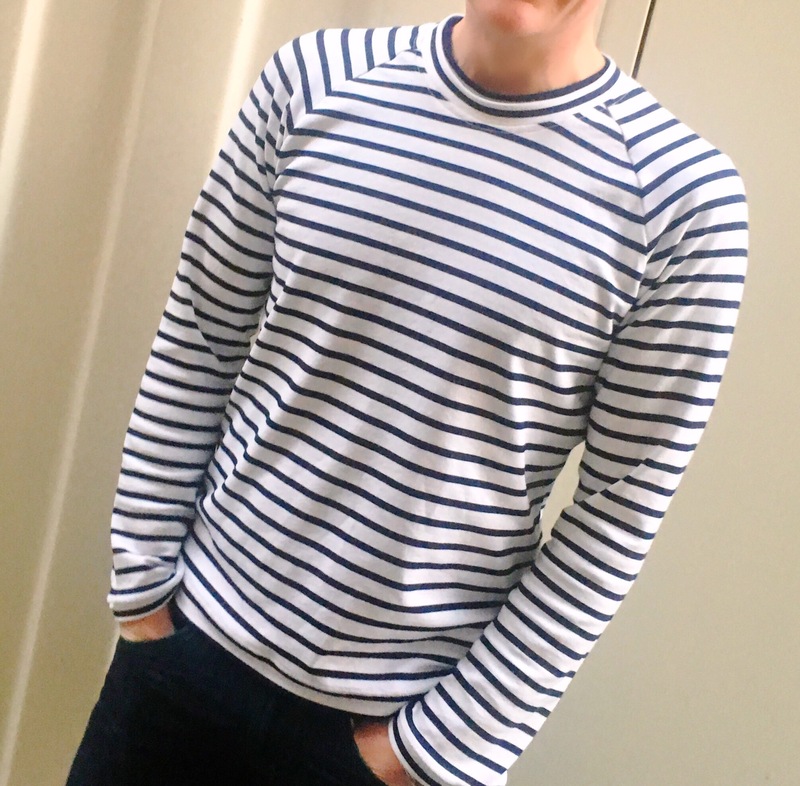 Not put off by the stripes, I went on to try the raglan version in the book too. 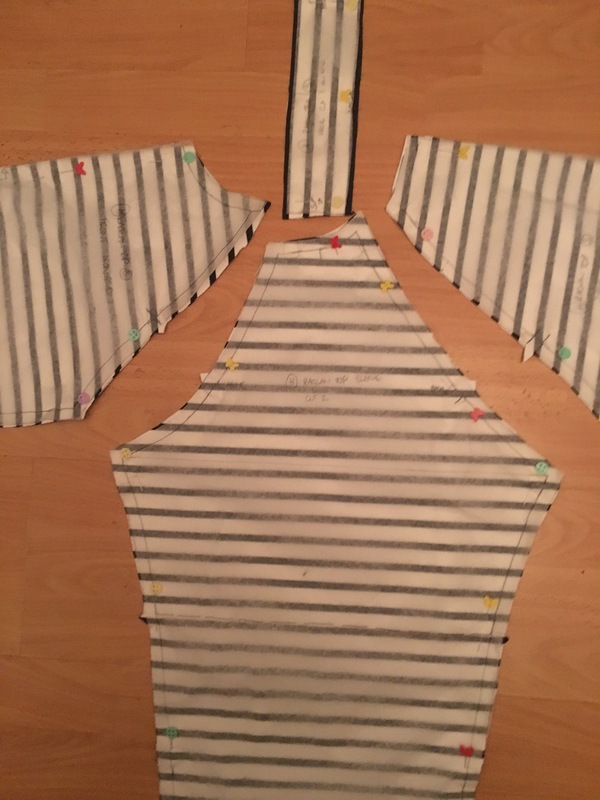 I wanted this to be long sleeved, there was no pattern piece for this, so I traced the top of the raglan short sleeve then overlaid the tracing on to the pattern piece for a the long sleeve hoodie. This was a regular sleeve, so I joined up the armpit line and traced down to the wrist from there. In my haste, I hadn’t accounted for the cuffs on the hoodie version and the sleeves came out a tiny bit short. No problem, I quickly whipped up some cuffs and I actually prefer it with them. 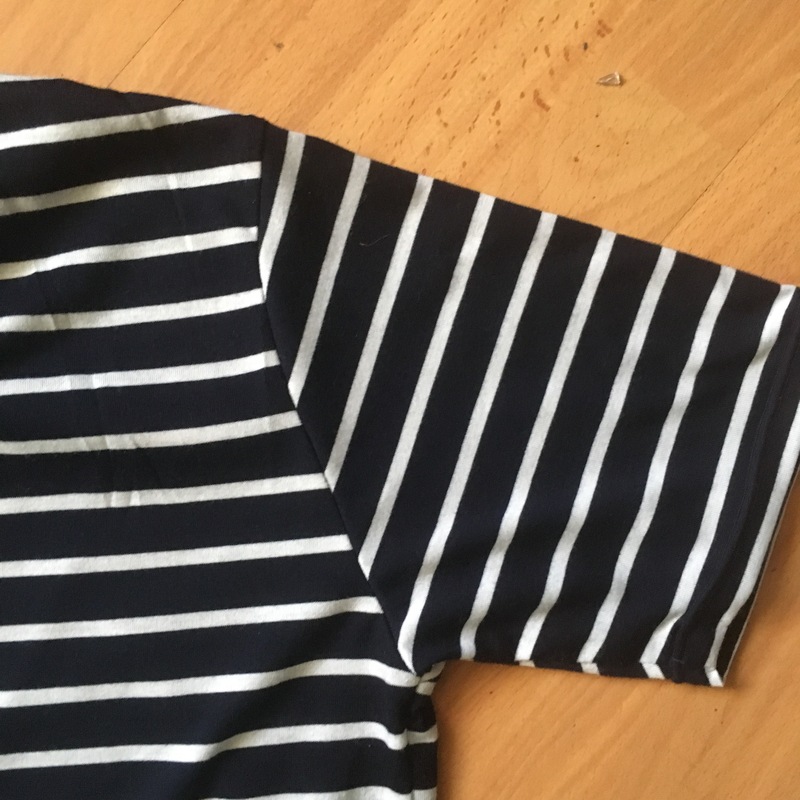 The stripe matching went much better over a raglan sleeve, slightly annoying that I got the match better at the back than the front, but I’m still over the moon with it. So that’s two patterns done from my new book, and I’m really pleased with them. In fact, I’ve hardly taken them off. It’s definitely two-top-weather in london at the moment. I think I’ll move onto the trousers next. Looks like it’s going to be a year of selfish sewing ahead for me! If not translating the words, at least follow the pictures, the whole idea is to learn new techniques. Used lightening stitch & walking foot to construct, overlocker on raw edges & twin needle for hems. Get some envelopes to keep patterns in. Both shirts are looking great. 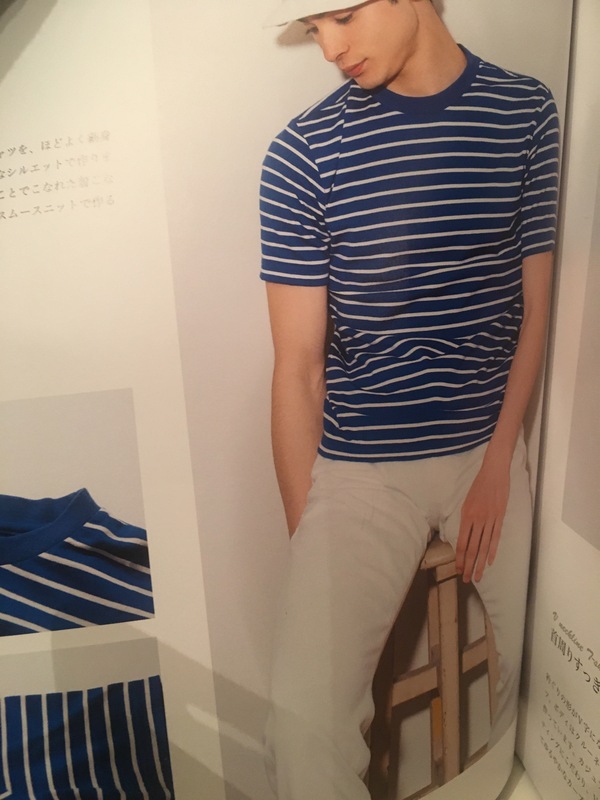 The stripe matching in the raglan shirt is well done. 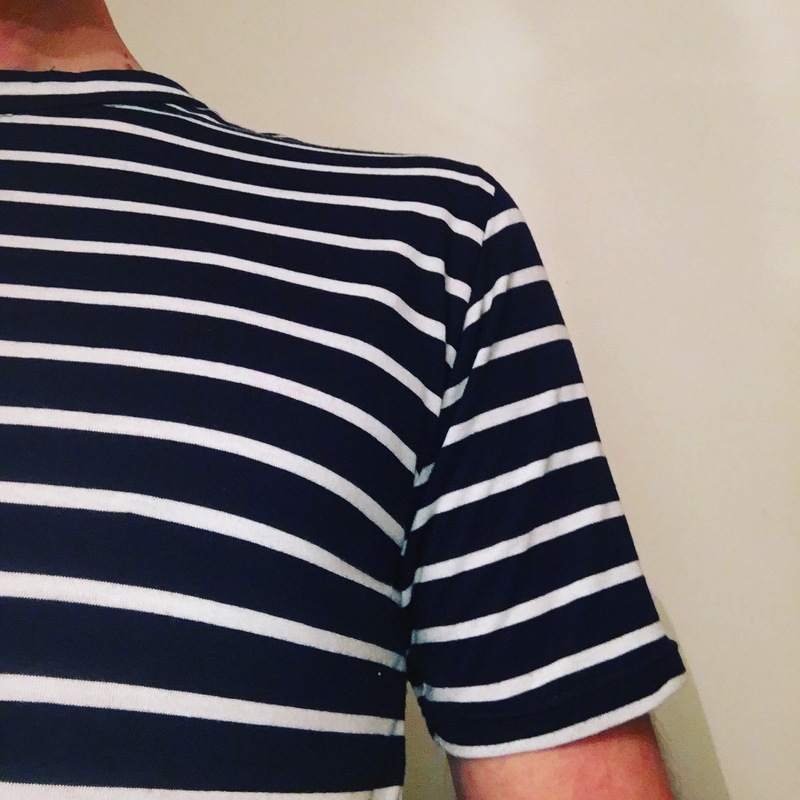 The navy/Breton look seems to be one of the fashion styles for Spring/Summer 2017. Your shirts are great. I’ve not made anything with raglan sleeves. I’ll have to try. I have an overlocker that’s been in a closet for 4 or more years. I’m afraid of it. It took just a year to try the serger and now I use it on every project even if to just preshrunk the fabric. And then there are the Japanese sewing books!!! It’s Mary not May. Can’t type. Thank you! Yes, definitely try a raglan pattern. It makes such a nice change from setting in sleeves! I definitely need to get to grips with this overlocker… I don’t have a DVD player, but might have to invest in one… I wonder if the info is available on YouTube…? Or… you could do a ‘love-your-brother’ blog post with everything I need in it!! 😉 … seriously though, coverstitch! Amazing! Right, I know what my next mission is… love my ‘brother’! Damn kids! Lol! Bypass them & get an iPhone! I do all of this on mine, hardly use the phone function at all!